OpenMPT doesn't terminate it's processes and i can't close them. Each time i close MPT, it's process remains. When i try to end any of the processes, i get an access denied message. The processes also remain even after i reboot my computer. This appeared to be because Windows wasn't shutting down properly and it left some programs on. Thanks, Windows! Re: OpenMPT doesn't terminate it's processes and i can't close them. Do you hibernate your OS session instead of doing a proper full shutdown, by any chance? Anyway, i had never experienced such kind of misbehavior before, really weird. Especially the low memory amount some of those processes are using is puzzling. Might be some serious kernel-level problem, that causes your system to not terminate the processes correctly. That's my blind guess here, but sometimes some aggressive/badly coded antimalware software can mess with legitimate stuff in unexpected ways, have you tried disabling it, in case you're using any? Also just found this helpful article after a short while of research, so it might mean some of drivers OpenMPT uses migh be faulty. Have you changed your sound output API recently, or updated any hardware drivers? This might prove to be the culprit here. Each time i close MPT, it's process remains. When i try to end any of the processes, i get an access denied message. Does it also happen if you do not use any VST plugins at all? Does it happen with every sound device type? The fact that you cannot even close the processes at all via task manager is very strange. I am not even aware what OpenMPT could even be doing to prevent that. The processes also remain even after i reboot my computer. This appeared to be because Windows wasn't shutting down properly and it left some programs on. Thanks, Windows! Yes, Windows (since 8.0) does not shutown your system by default when you select "shutdown", but instead only hibernates it. Selecting "reboot" does a proper system shutdown and restart though. VST plugins and/or buggy sounds drivers would also be my two top suspects, although not being able to kill the processes (and the low memory footprint of 28K of those zombies) makes me tend towards the latter. I doubt there is much we can do, but a memory dump of the process in this state would be helpful to at least confirm these ideas. You can create one by right-clicking the process in task manager and choosing "Create dump file" (warning: this file will be large, so compress it with 7r or rar if you are going to upload it somewhere). Also, if you are on Windows 10 v1709, you should note that a reboot or shutdown when the program is still running will make windows relaunch the program at startup whether you want or not. If this happens, it can become stuck in the boot sequence even if you close the program normally. I had it so badly that Windows would open 3 empty word documents at startup and it was nearly impossible to make windows stop doing that. I am rather sure that Word integrates with Windows' restart manager (which does not just exist in Windows 10) though, which OpenMPT does not. 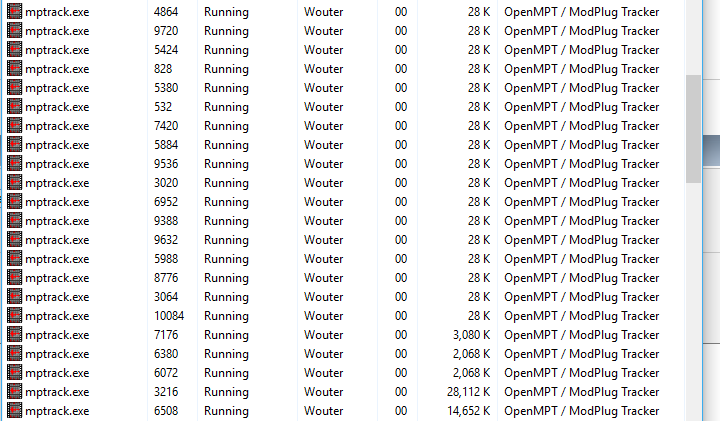 Even if OpenMPT made use of the restart manager, it would not explain dozens of dead processes spawning on restart. No, that's not the case, but Windows has had a startup manager for a long time but only few programs make use of it (much less than on some other platforms). It's an optional feature that a program can opt into. Of course if there's a bug in the implementation (which could very well be inside Word here), this might not work as intended. As Saga Musix said, also happens at my side when I use Farbrausch V2 (which is known to be buggy). This VST keeps the PluginBridge32.exe hanged and I need to kill PluginBridge manually so OpenMPT can exit normally. Try to check if PluginBridge32.exe or PluginBridge64.exe are still executing when you close OpenMPT. I even noticed that closing all songs with buggy VSTs may lead to OpenMPT get stuck between it and PluginBridge because leaves PluginBringe* on execution. Okay guys, I know you just want to be helpful but at least try to read the initial post a bit more carefully. He mentioned that he cannot kill the process manually, and it's clearly mptrack.exe that's hanging, not a plugin bridge instance.